The wQuiz program is a customisable program designed for running interactive quizzes over the Internet. 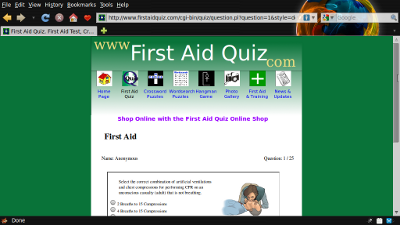 The program was first designed for use on the www.firstaidquiz.com web site, but has since been made updated to make it more flexible and made available to the public. The quiz engine is written in PHP and designed for use on a Linux server with the Apache server, and a MySQL back-end. The quiz should work with other operating systems, web servers, and databases, but may need some changes tothe code. The test system is based on Xubuntu Linux 13.10. Updated March 2014. This is a minor bug fix of some admin functions. This is a minor upgrade from version 0.4.0. The new files will extract into a new directory name and should be copied over the existing files. There are no changes required to the database or configuration files. For upgrades from other versions please see the full documentation. The documentation included in the archive file is in OpenDocument Format as used by LibreOffice. They are also made available here as PDF files. This software is released under the GPL v3. The general principle is that you can use the software free of charge. You can also modify the source code, but any changes must also be released under the same license and be available for free. These are some of the significant events in the development of the wQuiz program. Complete rewrite as a perl cgi program. Multiple Quiz Option was added. Dynamic scripts were also created for generating other pages using cgi. The dynamic scripts were dropped in later versions, as the functionality was replaced on the web site with PHP. Offline version was created, as well as the option to use different style sheets. The multiple css feature is under review and may be dropped. HTML could now be W3C HTML compliant. Tables replaced with CSS. Development on the new 0.3 version. The 0.3.0 version was a development stage, not used significantly. Basic Quiz Administration tools added. Changes made to remove the dependance on the Cache::FileCache perl cpan module. This meant that the program was now suitable for running on a hosted web server where additional cpan modules were not made available. Complete GPL release, published on the web site. Includes Quiz Adminstration tools, and all hardcoded quiz information removed. Administrator and User Guides produced.